Eleotin® Products, based on P-700 (Eleotin®) technology, have been used by more than 60,000 diabetic patients as of 2006 (100,000 as of 2008). 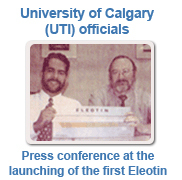 The documents below demonstrate how researchers at the University of Calgary, and other universities, declared that P-700 (Eleotin®) is not just a symptomatic treatment, but a‘cure’for Type II diabetes, and it restores normalcy for 70% of patients”. Many medical doctors around the world are using Eleotin® products on themselves, recommend-ing them to their patients and publishing scientific studies on the products. The efficacy and safety of Eleotin® is well recognized and established internationally.The Chinese equivalent of the US FDA issued an approval after rigorously performing animal, toxicology, and clinical tests. A few governments followed suit. These approvals and permits cover 40% of world population now. Eleotin® products have been sold to more than 50 countries. Dr. Youngsoo Kim, CEO of Eastwood Bio-Medical Canada Inc. has appeared regularly on national television networks. In China, patients and their families occasionally organize large and crowded welcoming rallies for Dr Kim to express their gratitude. On the basis of the efficacy and safety, several governments issued approval for Eleotin® products within a much shorter time than usual. The books pictured below are used as textbooks and teaching materials at several medical education institutions. Eastwood Bio-Medical Research Inc. produces many other products for hypertension (high blood pressure), high cholesterol, childhood obesity, and diabetic foot care. The company also produces health education programs. The most reputed Chinese University, Tsinghua University, not only approved of Eleotin® products, but also became our representative distributor in China. There are approximately 30.000 websites that talk about Eleotin® products.